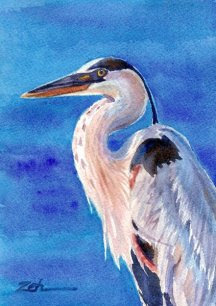 Here is a portrait of a Great Blue Heron, the largest and most widespread of our herons in North America. You will find the Great Blue hunting for fish along the coastline as well as ponds far inland throughout the continent. Many herons suffered a loss in their numbers due to hunting for their plumage, but the Great Blue's feathers were not as in demand, evidently, which can partly account for their larger numbers. Although Great Blues eat primarily fish and aquatic life, they do eat other small animals. Once at twilight, I saw one of these large herons fly directly above my head as I stood on my front porch. I was surprised to see a mouse grasped in its claws. It flew to the top of a tree in the neighboring field where, I assume enjoyed it's evening repast.